When was the last time you had a good nights sleep, without waking up because of your or your partners snoring issues? Spouse abandoned your bed? Mouth Breathing challenges? Snoring effects everything! The Stop snoring set is finally here to help you in having the most relaxing sleep and the most productive days. How to use it ? 1. Put it on head with the strap and adjust to make sure it keeps your chin up and close. Get the hook and loop tightened at your best position. 2. Put another strap behind the ear and tighten the velcro. 3. Adjust the hook and loop to fit your head size till you feel comfortable. What is in the bag ? 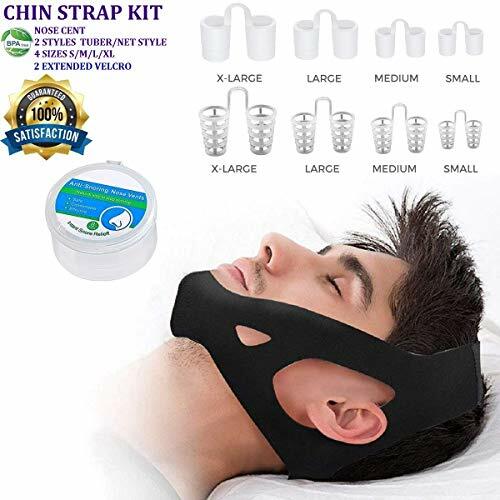 1x Anti Snoring Chin Strap 1 x Set of 8 different size nasal dilators, made of BPA free 1x Nose vents carrying case 1x Instruction 2x Extended velcro Click " ADD TO CART" button now, and get your premium anti-snore device kit .If, for whatever reason you are not happy, simply reach out to our team and tell us about your experience. We will do our best to help, or your money back!